Grace has a real talent for baking and a passion for making delicious dreams come true. When her mom announces a trip to visit relatives in Paris, Grace isn't so sure about leaving her friends and their cupcake business. That is, until she discovers she'll get to work with her uncle and cousin in a real French pastry shop! But nothing goes as planned and her attempts to help out end in disaster. Grace is determined to make things better and with some help from her family and a little pup named Bonbon, she turns her vacation around. But when Grace returns home, she discovers a new problem--her grandparents' bakery is in trouble! With their dreams on the line, can Grace find the winning recipe for success? Yet another 'American Girl' film has been released under the name 'Grace Stirs Up Success'. Grace is a young girl who loves to bake cupcakes and french macaroons. When not laughing at literally everything on the planet, she works in her grandparents old bakery, which is failing as a business. Grace wants a bicycle for the summer, but her mom (Virginia Madsen, the only recognizable name) tells her she has to earn the money herself. Grace and her friends decide to start their their own businesses for the summer in order to buy themselves bikes, but Grace is informed by her parents that she will be spending the summer in Paris, France with her cousins. Grace ends up going to Paris, where she learns a little bit more about French pastries, however the film never becomes that realistic. Instead, it's a fairy tale type of situation, where nothing bad ever happens, and these young girls who are watching these movies would believe that everything will come true and be as easy as following a recipe in real life. Even when friends and family get mad, or when a business is failing due to a financial situation, all you have to do is put on a smile, spread red frosting on a cupcake while listening to whatever is the most popular song on your iPod, and everyone will live happily ever after. That's no joke here with this movie. Oh yeah, I forgot to mention that 20 minutes of this movie is devoted to a reality show segment, where young kids compete to be a master chef. It's filmed like a reality show, complete with music and title cards. In the end, 'An American Girl: Grace Stirs Up Success' might entertain a very young girl with the over abundance of good messages, family, and fun. However, at the same time, these messages and good outcomes are not part of real life and are not so easily acquired. That being said, the food in the film did look mighty tasty. 'An American Girl: Grace Stirs Up Success' comes with an okay 1080p HD transfer presented in 2.40:1 aspect ratio. Overall, the image largely looks good, however, this overly digital picture has some issues. Detail is mostly sharp and vivid, showcasing almost every imperfection in the baked goods and makeup blemishes on the actors nicely. Though with this strong digital presence, the image goes flat in the wider shots, not giving the image hardly any depth. I hate to say it and sound like Huey Lewis here, but the colors are just too darn loud and bright here. It's as if they turned up the color saturation to eleven, as to make younger viewers more interested in what's happening on screen. Nothing looks real. Skin tones are somewhat natural, but look hindered, and the black levels are mostly deep an inky, if not on the light side of things. There is video noise throughout, as well as some minor banding and aliasing. It does the job if you're showing the movie to someone under five, but other than that, it could've been better. This release comes with a lossless DTS-HD 5.1 MA track. Despite the film itself and the video presentation above, this audio track is fairly good. Sound effects, whether it be cooking and kitchen related or city sounds, all sound very good. They are loud and lively throughout with good enough play on the rear speakers. The songs featured in the film might be down right deplorable and make you question these musicians lot in life, but they sound very good over the speakers, delivering a very full and well-balanced sound. The bass has a nice rumble as well. Dialogue is always crystal clear and easy to follow, even with the ridiculous French accents. There were no instances of any pops, cracks, hiss, or shrills either, which is surprising, due to all of the screams and high pitch laughter. This is a solid audio mix from Universal. 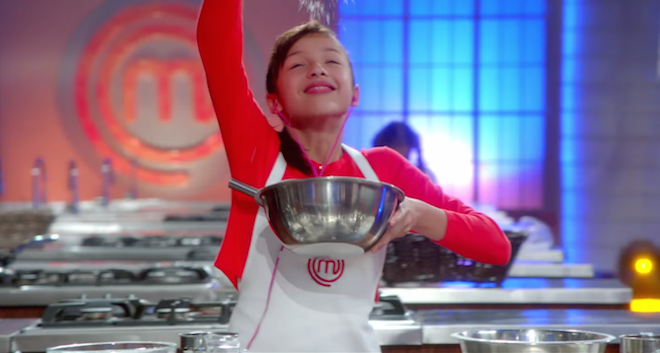 Master Chef Junior (HD, 2 Mins.) - A small look at how the young actors learned to sort of make food on the set. Doggie Day Spa (HD, 2 Mins.) - People washing big dogs. That's it. Playing Dress Up (HD, 2 Mins.) - The young girls in the film try on different outfits. Trailers (HD, 6 Mins.) - Trailers for the other 'American Girl' movies are shown here. 'Grace Stirs Up Success' should mildly entertain young girls who are fans of the 'American Girl' doll line. For everyone else, this might not be your cup of tea. The video presentation is okay at best, but the audio presentation is solid here. The extras will only appeal to the younger crowd as well. If you have someone who is a die hard fan of the 'American Girl' doll line, then they'll probably enjoy this, otherwise, feel free to skip this one all together.